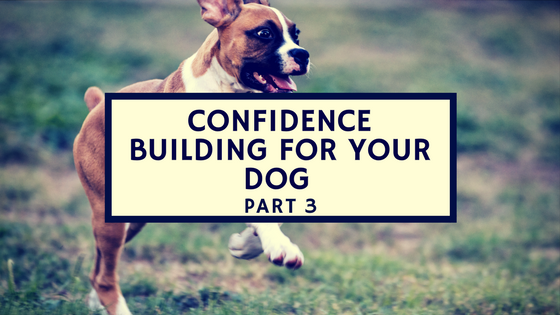 In the first two parts of our confidence building series we talked about different theories regarding confidence building in doggos and then we discussed some exercises you can do with your dog during the rehabilitation process. Now we are going to go over the final part: the Do's and Don'ts of building confidence in your fearful dog. Don't be afraid to discipline your dog. Walking on eggshells around your nervous dog is probably feeding into their anxiety. If you are not sure how to pick out constructive ways to correct your dog, hire a dog trainer (ooh ooh me!). I probably don't even need to say this to you dog-lover readers, but don't use a whole lot of super scary, harsh corrections with a fearful dog. Do what your have to ino order to gain your dog's attention in a scary moment, but do not go overkill. Firm is good. Spastic is not. Do adopt a can-do attitude. Believe your dog can do whatever The Scary Thing is preventing them from doing and go about your day like you expect your dog will succeed. Don't get frustrated with your dog. 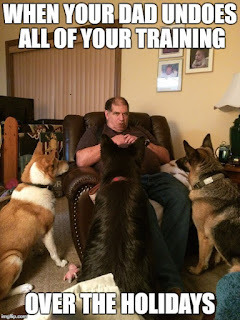 Frustration has no place in dog training. If you find yourself frustrated, take a breather and re-attack. Your frustration is going to make your dog nervous and is not going to be productive. Do get an expert opinion on your dog's fearful behavior if it is getting out of control. Many times dog owners think their dogs are afraid when really their dogs simply think they own the pack. Find someone (ehem or hire a dog trainer) to suss out the situation and figure out exactly what is going on. Don't avoid Scary Things because your dog is scared of them. If you avoid them, then you give reason to your dog's fear. If you avoid The Scary Things they must be scary. Do work on your dog a bit every day. Dogs are creatures of habit. Create a habit of fear facing each day and the dog will start to relax into confronting The Scary Things. Expect your dog to be rehabilitated overnight. While some dogs do progress quite quickly, the usual is for the rehab to take months. Fear-based issues take a while to solve. Keep reinforcing your dog's learning and confidence even after they seem to be good to go. Dogs, just like people, progress and regress. The key is to keep the progresses larger than the regresses. Don't let your dog's fear dictate your life. You are in charge. You dictate how life is within your pack. If you let your dog's fears delineate your life, you are enabling and not fixing the problem. Be consistent. Give rewards for the same behaviors and correct the same behaviors. Don't punish your dog for getting on the couch one day and then snuggle her doing the same thing the next. Pick the rules and enforce them. Always. 100%. With every family member. What if you have that one family member that refuses to enforce the rules? It's not actually the end of the world. That person will not have the right be be offended when the dog disrespects them though. 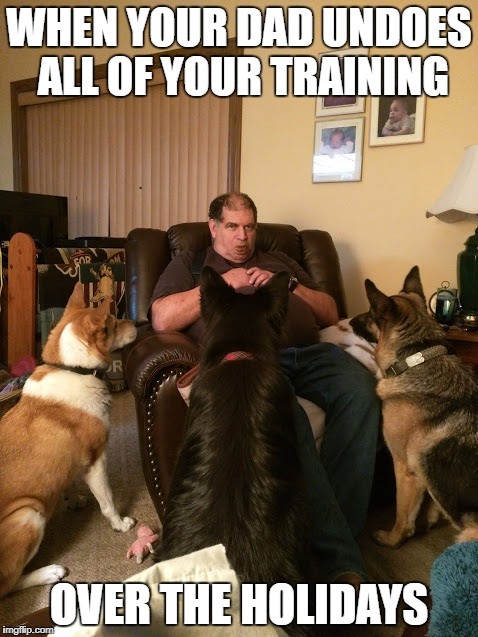 The dogs walk all over my dad. He is not allowed to complain. Your dog can learn to respect everyone else besides the Rule Breaker. My dad is a notorious Rule Breaker. Don't get too caught up in figuring out exactly what is triggering your dog's responses. Sometimes it is useful to know what is causing the fear. But sometimes people get so caught up in finding out what the trigger is that they forget to actually focus on the problem at hand: the dog's behavior in the moment. If you can figure out what The Scary Thing is, great, that can help. If not, don't worry about it too much and focus on fixing the dog's responses. Sometimes a dog can react to something we cannot even detect such as a faint smell or a sound we cannot pick up with our lame hooman noses and ears. Instead, focus on helping your dog when you begin to see the fear response. I cannot tell you the number of clients I have had that will not take Fluffy out on Tuesday morning when there is a man with a red hat on the sidewalk or will turn around and walk the other way if the dog's lunar sign is off and there is a purple mailbox in the path, and other such ridiculous coping mechanisms that people have developed to try to explain their dog's fear responses. Instead of avoiding, let's start fixing. Although I do have to give some of them credit: it took a lot of brain power to come up with those triggers. They love their dogs, no doubt about it. Do give yourself and your dog some credit. This is a hard process, so give yourself a bit of slack. Which goes along with Don't be too hard on yourself or your dog. Keep slugging away. I'm sure your dad appreciates his now infamous online legend!